There are two resources that families looking for Missouri colleges should visit. One is MissouriConnections.org which is the usual online system for doing career exploration and creating portfolios. The website is sponsored by the State of Missouri education departments and workforce development. To gain full-access to the system, you’ll need login information provided by a school counselor. With guest access you cannot use the portfolio option. The website includes a detailed college search feature and the ability to compare up to three schools. Besides the six page checklist PDF for paying for school, the financial aid information is limited and links to off-site resources. There is also a scholarship finder that can be sorted on a variety of factors including gender, religion, and GPA. For Missouri specific financial aid information, you should visit the Missouri Department of Higher Education. There is information on a variety of financial assistance programs include the Advanced Placement Incentive Grant and Access Missouri program. Users should make sure they visit the publications sections for some useful PDFs to download. The Source is a comprehensive 23 page overview of the college admission process worth downloading. Students will find financial information including sites for the FAFSA Frenzy events. There are a variety of webinars, preparing for college checklists, and students can sign up for monthly email reminders. Students interested in transferring can find information on schools participating in the statewide articulation agreement. There are 42 four-year Missouri colleges with 500 or more full-time undergraduates in Missouri according to the Integrated Post-secondary Education Data System. Almost 40 percent of students attend one of the 29 private Missouri colleges while approximately 60 percent of students attend one of the 13 state institutions. 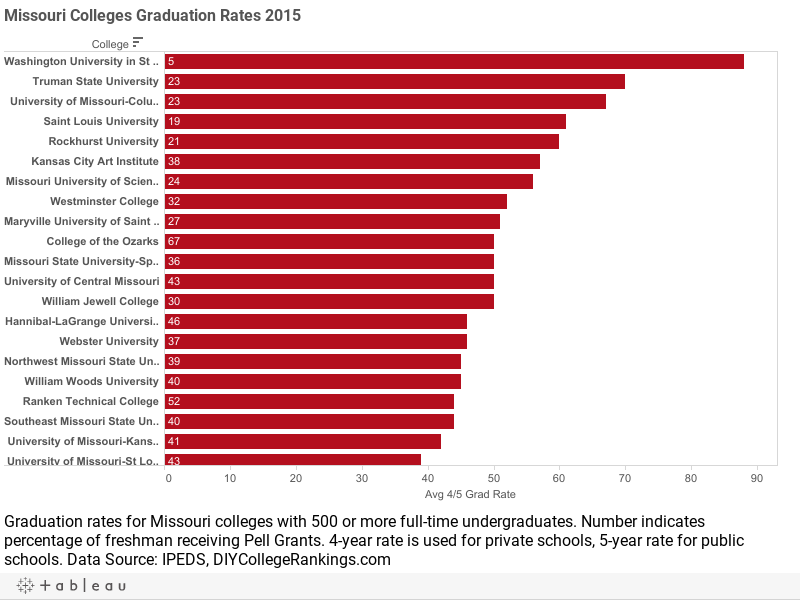 Missouri private colleges have an average four-year graduation rate of 38.7% and the public universities have an average five-year graduation rate of 41.8%. 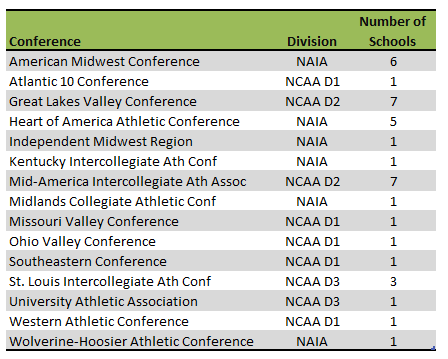 Eleven Missouri colleges meet the DIY College Rankings 50-50 profile requirements. In Missouri, the average Composite ACT score was 21.7. The English score was 21.4 and the Math score was 21.0. The 75th% Composite score was 25, English was 25, and Math was 25. A total of 26 Missouri colleges ACT 75th% Composite scores were at or above this level.